We love the golden colours of autumn and with warmer weather than usual for this time of year, it’s a perfect time to explore the UK. Why not enjoy the British autumn touring in your caravan or motorhome? 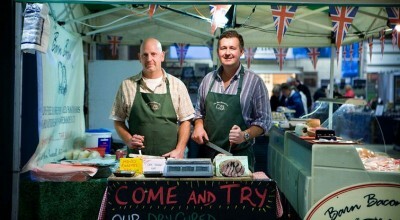 You might even be able to stumble across a local food or craft festival in readiness for the festive season. We’ve picked out some top attractions recommended by Visit Britain and other events from across the country. Yorkshire Sculpture Park, West Bretton, West Yorkshire. Wave is part of a UK-wide tour of the iconic poppy sculptures from the installation Blood Swept Lands and Seas of Red at HM Tower of London last year. Visit the sweeping arch of bright red poppy heads suspended on towering stalks, created by artist Paul Cummins and designer Tom Piper. 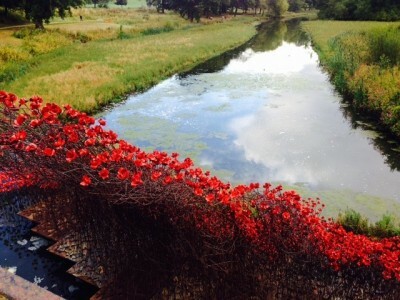 The beautiful poppies rise up from the Yorkshire Sculpture Park’s Lower Lake, almost reaching its historic Cascade Bridge. The park also has many other fantastic indoor and outdoor sculptures on display across its 500 acre open gallery as well as its indoor galleries. 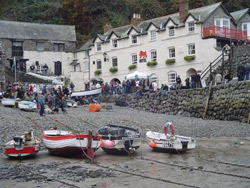 Once a major centre for herring fishing, Clovelly in North Devon, celebrates the tasty, nutritious “silver darlings of the sea” in their annual Herring Festival. There will also be net making, flax processing and a curragh on show provided by ‘Flaxland’. Plus visitors will also be able to enjoy a wide variety of herring dishes in the quay kitchens or at the Harbour Bar, cookery demonstrations, live shanty and sea song singers, stilted entertainers, other local food and craft stalls, a photographic exhibition of Clovelly herring fishing, a Herring Hunt, face painting, henna tattoos and National Trust event-themed, free craft activities. For a family day out with a difference, head to Alnwick Castle. This glorious medieval castle has been the setting for many great films including Harry Potter. And if having a whole castle to explore isn’t enough, children will love Knights’ Quest, where they can experience what it was like to be a real Knight or Lady. They can dress up in clothes of medieval times, learn the art of swordsmanship and even have a go at jousting. And Downtown Abbey fans can explore a brand new exhibition, featuring photography, costumes, and props from the filming. Group visitors can also enjoy a groups-exclusive Downton Abbey Tour of the State Rooms. Call 01665 511 184 to register your interest or make a booking. There’s something for everyone during the Hallowe’en and Christmas Adventure at Stockheld Park. They have an outdoor ice skating rink, an Enchanted Forest filled with interactive sculptures and playgrounds, a huge snowflake maze, Nordic ski trail, award winning Santa’s Grotto, magical gift shop and jam packed special events calendar. And once you’ve experienced all they have to offer you can relax in their licensed Woodland Café, serving home-made, locally sourced food. The award-winning National Space Centre is the UK’s biggest attraction dedicated to space, offering hours of interactive discovery and fun. There are six themed galleries covering topics like ‘Orbiting Earth’ and ‘Exploring the universe’, and each with amazing space rockets, satellites and capsules, and hundreds of fun and educational interactive activities. An invasion is planned on 28 and 29 November 2015 when the centre hosts a weekend for the UK Steampunk community. 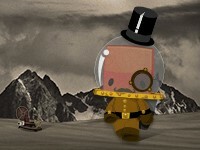 The dirigibles have taken to the sky for a weekend dedicated to rockets, steam, tea, and cake! The small Welsh town of Hay plays host to a mini version of its annual summer gathering, with a Winter Weekend of book talks and readings. On Saturday November 28th, a day-long food festival takes place in the town’s market square, with more than 40 local food producers setting up stall. Landmark is fun, a discovery and real adventure for all ages. Ride the runaway timber train rollercoaster, rock climb, ‘skydive’, flume ride on a Water coaster, try two high level ropes courses, tackle a treetop trail, experience the UK’s only working steam-powered sawmill, explore the world’s only Bamboozeleum ©, discover the secrets of a 10,000 year old pine forest and a great deal more. Locally sourced food, gifts, cookery demonstrations, wine tasting and traditional craft workshops are on the menu at the Lincolnshire Food and Gift Fair. 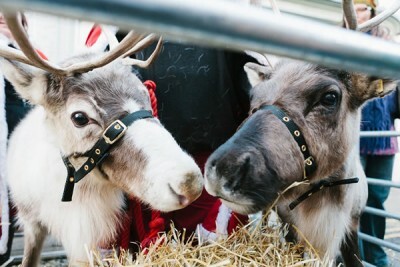 There’s a real festive theme with more than 200 food and craft stalls, as well cookery demos and cocktail masterclasses. Stock up on chutneys and pickles to accompany a seasonal cheeseboard, taste test pork pies for a Boxing Day lunch or Christmas puddings for the big day itself, learn how to craft the ultimate Christmas Eve tipple or just stock up on food-related stocking fillers. Longleat, Warminster, Wiltshire, BA12 7NW. See how you measure up to a giraffe, watch out for the zebras crossing, wander amongst the wallabies in Wallaby Wood and be enthralled by the majestic lions, tigers, rhino and more! Kids love Animal Adventure, a chance to get close to the cuddlier specimens at the park. Help staff with day-to-day tasks looking after ferrets, guinea pigs, tortoises and more. There’s also a butterfly house, rides, a maze, miniature railway and an adventure playground. This popular Festival Event is held in Bridlington’s Old Town and features more than 60 food and craft stalls up High Street and an Old Town Fair in the Market Place. It’s also combined with choirs, brass bands, an old fairground organ and the arrival of Santa on his sleigh, complete with his reindeer & elf helpers. Stall holders will likely be dressed in Dickensian attire – and this year’s Dickensian Festival promises to be a ‘Food Extravaganza’ with so much to choose from. Please share any of your autumn caravanning or motorhoming exploits or plans in the comments section below…! From reading the above article, there doesn’t seem to be much going on in the South East of England. Is that because there isn’t anything?